Co-owned by Gary Obermire (former Senior V /Operations at defunct Country Coach, LLC) and Louie Courtemanche (former Country Coach, LLC Sales Manager), Premier RV of Oregon celebrated its 5th anniversary as a business in 2015. The company formed after the manufacturer of Country Coach brand motorcoaches closed its doors. Premier staff is committed to serving their motorcoaching friends when they have need of service, coach consignment, or storage with the same degree of excellence as when their coach was originally built. Premier RV also purchases motorcoaches. Trades welcome. With over 150 years of combined Highline Motorcoach experience, Premier RV Services staff welcomes the opportunity to earn your repeat business. Read the Testimonials from a few of the customers we’ve had the privilege of serving posted at the Premier RV of Oregon company website. Offering the Largest Selection of Pre-owned Country Coach Motorcoaches in the United States (and select other highline diesel motorhomes)! Premier’s inventory is comprised of carefully selected, gently used and well maintained highend motorcoaches. A Premier Coach is by Referral Only. If you don’t see what you’re looking for when you visit, please inquire as we can probably locate the coach length and model you have in mind! 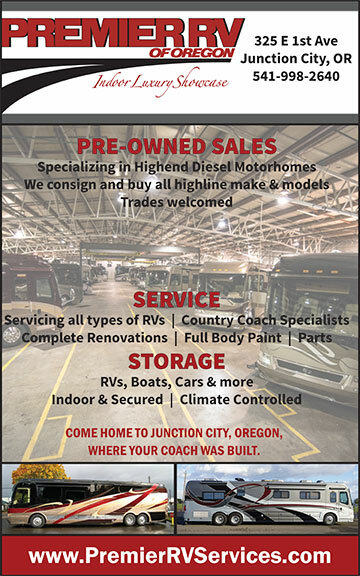 Premier RV of Oregon offers complete house and chassis service including exterior paint and body work, complete renovations (tile, carpet, cabinetry, etc), electronic upgrades such as TV, HD Satellite, GPS, and a great Parts Resource for all your RV parts needs. We do it all, big job or small! Specializing in Country Coach, all brands of RVs are serviced. Premier Service Technicians are all highline motorcoach specialists and well-known “favorites” among motorcoach owners with a reputation for their quality service work. Willamette Valley’s largest indoor, secured climate controlled storage facility for RVs, Boats and Autos. The Premier RV Services Parts Department is your source for motorhome parts including those hard to find ones. Contact Kevin at 458-210-0784. Open Monday through Friday, 8am-5pm. Premier RV of Oregon is located 325 East First Avenue, in Junction City, Oregon on 20-plus acres of the former Country Coach LLC manufacturing plant campus. From I-5 Northbound, take the Randy Papé Beltline exit, turning left (west) and continuing to Santa Clara/River Road Exit. Turn right on River Road and continue 10 minutes through picturesque farmland. As you reach Junction City, Premier RV of Oregon is the first left (see Premier RV signage).